Jim Davis is a man on the run. He comes across the body of a dead man wearing the badge of a marshal. He buries the body and takes the badge and rides on. At the next town, he is mistaken for the dead man, a legendary marshal named Brennan. The town sent for Marshal Brennan because they were facing a crisis that includes among other things an epidemic. The Stranger decides to stay as a way of hiding from the men chasing him. 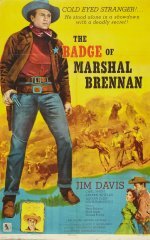 What he does not realize is that when he takes on the Badge of Marshal Brennan, he takes on the responsibilities of Marshal Brennan.